What Is Simple EPUB Reader? Simple EPUB Reader is a Chrome App which lets you read EPUB-files. 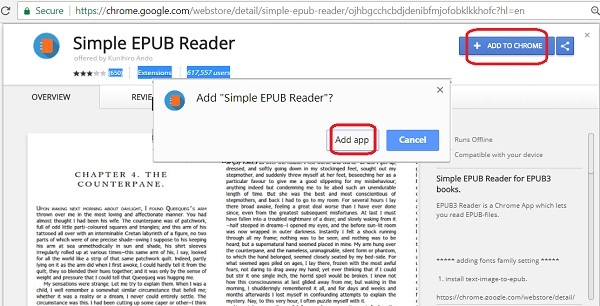 You can follow this tutorial to download and install Simple EPUB Reader on Windows systems. 1. Run Chrome Web browser and go to Simple EPUB Reader in Google Chrome Webstore. 2. Click "ADD TO CHROME". You see a confirmation message box. 3. Click "Add App" to confirm installation. You see "Simple EPUB Reader" installed.